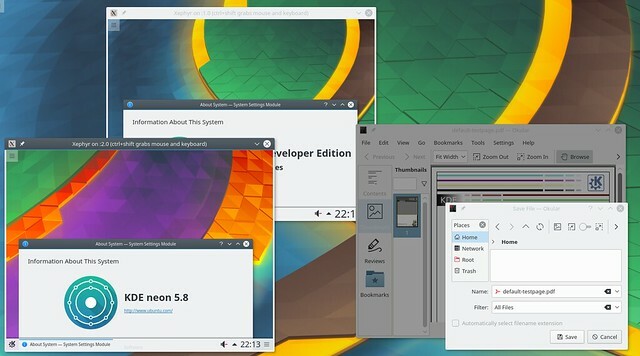 KDE neon provides an easy and elegant way for people to test the latest from KDE, or use the latest releases of KDE Software. Our mission statement above is what we try to do and having continuous integration of KDE development and continuous deployment of packages is great, if you have KDE neon installed. You can test our code while it’s in development and get hold of it as soon as it’s out. But wait, what if you want to do both? You would need to install it twice on a virtual machine or dual boot, quite slow and cumbersome. Maybe you don’t want to use neon but you still want to test if that bug fix really worked. So today I’m announcing a beta of KDE neon on Docker. Docker containers are a lightweight way to create a virtual system running on top of your normal Linux install but with its own filesystem and other rules to stop it getting in the way of your OS. They are insanely popular now for server deployment but I think they work just as well for checking out desktop and other UI setups. I’ve created two Docker repos each available with the same flavours we have for the Neon packages: Developer Unstable & Stable and User normal & LTS. The repos are kdeneon/plasma (2GB download) which has image with the same Plasma and limited apps our downloadable ISOs do, and kdeneon/all (getting on for 4GB download) which has all the apps built by Neon. This starts the X-server-in-a-window Xephyr then it runs the Docker client which tells your local Docker server to fetch the kdeneon/plasma image from the Docker Hub server and run a full Plasma session. This drops access restrictions to your X server (should be safe because network access is still off but reverse it once you’re done if you want to be sure), grabs kdeneon and runs okular. Here’s me running dev-unstable and user edition at the same time as running Okular from dev-stable to check the recent save-open dialog bug is fixed. It runs as user ‘neon’ with password ‘neon’ with unrestricted sudo access. Let me know how you get on (here, Reddit, neon@kde.org mailing list, bugs.kde.org, Telegram, IRC, whatever), I’m quite new to making Docker images so any improvements welcome.